The ominous warning marks the beginning of a new documentary investigation by Animal Equality, an animal protection organization, and Condition One, a virtual reality production company. The film, Factory Farm, premiered at Sundance Film Festival, but is seen here for the first time. Footage of this nature is not new. For years, animal activists have exposed the realities of industrialized animal slaughter. Today, groups like the Humane Society and Mercy for Animals have published undercover investigations on YouTube, prompting criminal charges, new legislation, and consumer outrage. Now, Animal Equality’s films are going even further. They are unique in that they are shot on virtual reality cameras, allowing 360-degrees of sight for the audience. In Animal Equality’s previous VR film, iAnimal, the viewer, guided by narration, experiences life through the eyes of a pig. 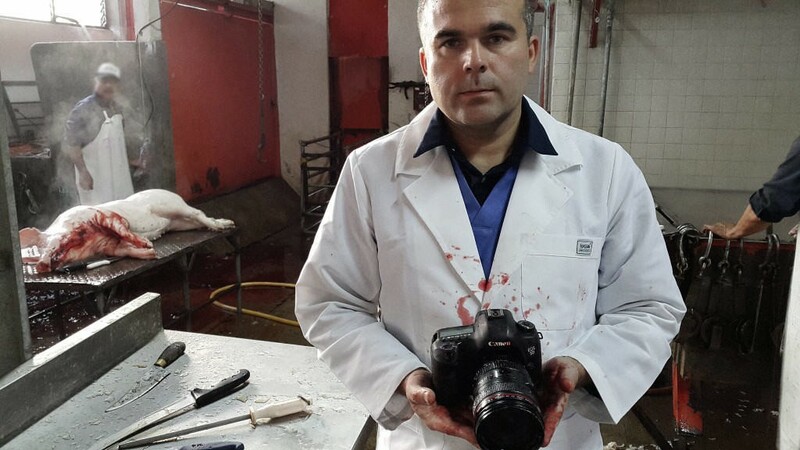 In Factory Farm, we stand alongside Valle as he photographs a pig’s confinement, castration, electrocution, and slaughter. Through the technology of VR we get a fuller range of sight into the life of an animal raised for slaughter. For example, it allows us to see the saliva coming from a pig’s mouth as it gnaws the metal bars of its crate and to rotate around to see the bloodied tail of a castrated piglet nearby. It allows us to see the reflections of workers in the pools of blood on the floor, and to move upwards to see their faces as they go about their work. With VR, we too, can hear the whirring and grinding of machinery in the slaughterhouse, the squeals of uncooperative swine and the yells of those who push and kick them to their fate. The films are designed to be viewed with a special VR headset, allowing the viewer to look around by turning their head. 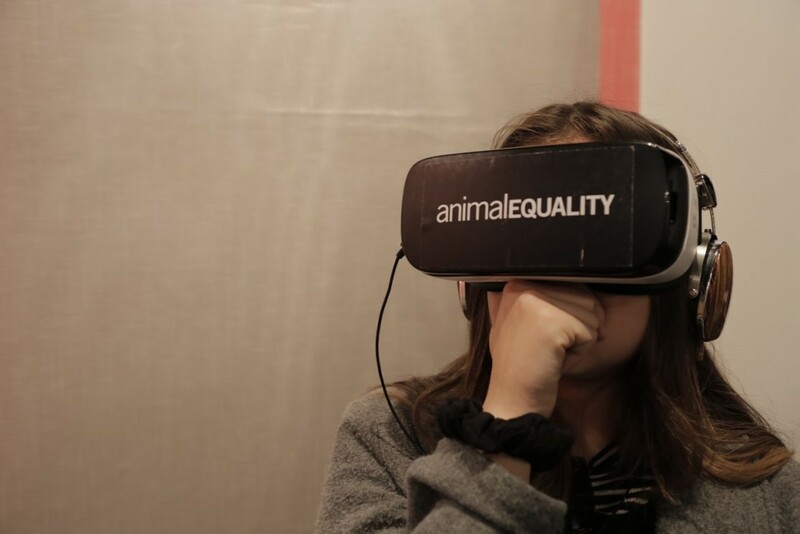 Currently, Animal Equality is touring UK and US universities with iAnimal and VR headsets, offering special street screenings. For those in other cities, the experience can also be emulated online, using the cursors to see left and right, up and down. “Regular footage of animal cruelty just feels like you are looking at a flat window, which is easy to emotionally distance yourself from,” observes Danfung Dennis, founder of Condition One. He says VR draws its power from the “command presence” it has over its viewers. “When viewed in virtual reality, you feel you are actually inside a factory farm in close proximity to the animals,” he says. This is important given how much of the experience is related to spatial confinement. For example, in iAnimal, the film begins with piglets suckling at the teats of their mother, who lies tightly wedged in a metal enclosure, known as a gestation crate. While VR technology has existed for decades, it has only recently received substantial interest. Facebook has acquired a leading VR company, and Sony, Samsung, Microsoft, HTC, and Google all have VR projects now as well. Once considered merely a piece of potential gaming equipment, Animal Equality and Condition One have co-opted VR technology to expose the dark depths of the meat industry. Factory Farm and iAnimal, incorporate footage of this industry from various parts of the world – the UK, Mexico, Germany, Spain, and Italy. However, the standardization of the practices and facilities make each location feel universal. Toni Shephard, Animal Equity’s Executive Director, says they confirmed how these practices have become standardized. “In the UK we have had some farmers and slaughterhouse workers watch the film at our events and all have confirmed that what we show is just normal practice, nothing exaggerated,” Shephard says. Unlike most VR experiences, Factory Farm and iAnimal do not just reveal a place that is hard to see. Rather, they reveal one that was never meant to be seen at all. Places such as these, much like the secret experimental prisons operating across the US, are carefully and deliberately hidden from view. Now, “ag-gag” laws in the United States are making it illegal to expose this type of animal cruelty. Those walls of secrecy are rapidly being brought down by animal protection groups. The only thing missing, for now, is the smell.